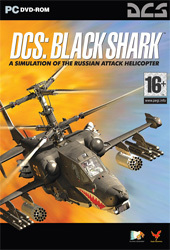 "DCS: Black Shark" is a PC game of the Russian Ka-50 attack helicopter and is the first title in a new Eagle Dynamics and The Fighter Collection simulation series: "Digital Combat Simulator" (DCS). Following Eagle Dynamics' tradition of excellence, "DCS: Black Shark" will bring an even more realistic simulation experience than its predecessor "Flaming Cliffs". "DCS: Black Shark" will offer an unprecedented level of realism in regards to flight dynamics, instruments modeling, avionics systems, and weapon systems. The artificial Intelligence of ground vehicles and helicopters has been improved dramatically as well as weapon modeling. A new Mission Editor includes a powerful electronic mapping system that allows user to easily create missions and campaigns. A new campaign system allows the front line of the battlefield to move back and fourth according to your mission success or failure.